Stage curtains, like clothes, have to be the correct size or they just don’t look their best. We have a page that details how to measure for curtains, but chances are, we have a professional dealer near you who can come measure your stage and ensure everything fits just right. Give us a call if you need any assistance or if you would like one of our professional local dealers to visit. Most don’t charge any fees to take measurements. 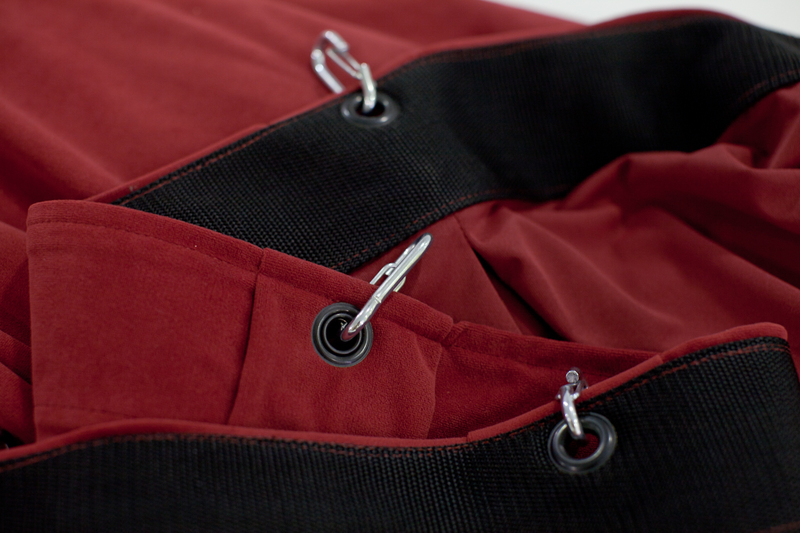 The top hem is reinforced by a continuous piece of webbing and grommeted every 12” with a heavy duty #3 steel grommet. Grommets have a durable non-reflective matte black finish. For curtains to be attached to stationary battens a 30” piece of black tie line is provided in each grommet. If the top will be exposed to audience view we offer “hidden grommets & ties” so the curtain covers the batten. Curtains intended to be attached to tracks are provided with 1-1/2” self closing bit snaps or, optionally, 1” self closing flush harness snaps. We generally recommend against S-hooks. Other grommet spacing and attachment hardware can be provided upon request. Fullness is how much extra fabric is sewn into the curtain and is achieved by making pleats. Typically, 50% fullness is sufficient although we recommend 75% or more for Grand Drapes and Valance. 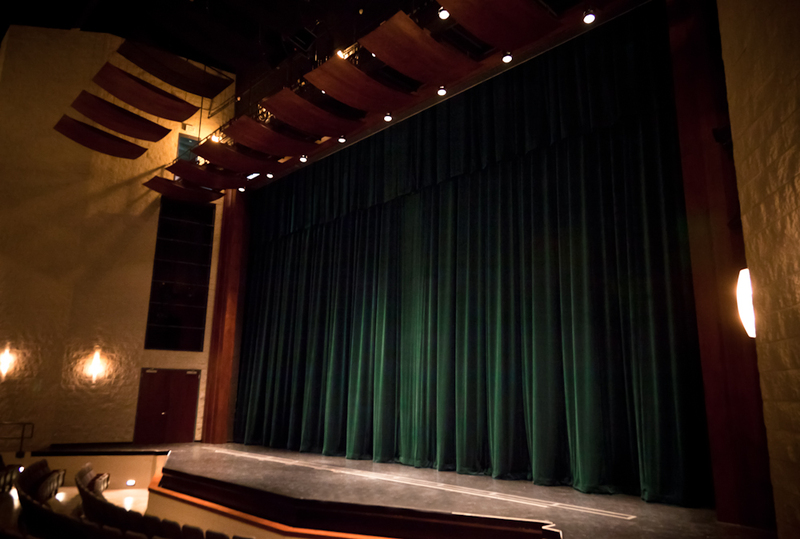 The extra fabric not only makes a theater curtain look more luxurious, but it also helps deaden stage noises and blocks bright back lighting, which is typical when the curtain opens to a fully lit stage. Our standard bottom hems are a 3” or 5” flat hem, a 6” hem with chain weight, a 6” hem with a reinforced pipe pocket, a 6” hem with a pipe flap, or a 6” hem with chain weight and pipe pocket. Chain weight is encased in a muslin pocket hung 1” above the bottom of the curtain to prevent excessive wear. Pipe pockets are lined with heavy weight muslin. Most any other hem can be accommodated. 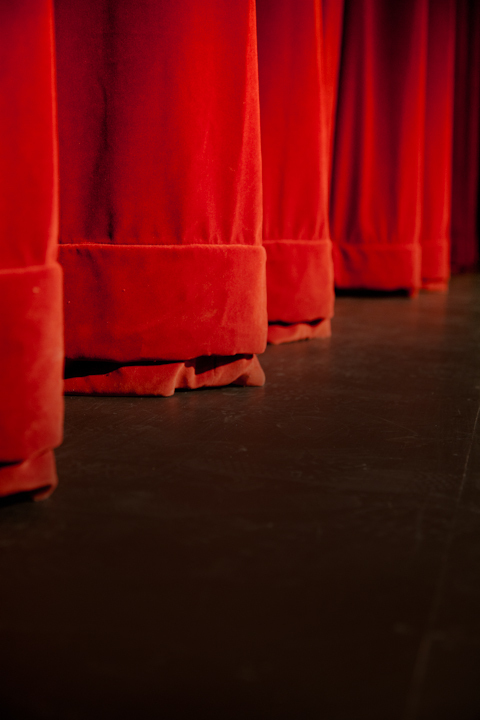 Lining is useful when the audience may see the back side of the drape – for instance, in companies that do “stage door” theatre whereby the Grand Drape is closed and the audience is seated onstage in a Black Box fashion. Lining can also be desirable in venues with significant lighting demands, in which excessive light spilling onto the back of the drape is unavoidable. Lining can also make the curtain have a slightly nicer movement to it and helps to deaden noise. However, in most cases, lining of theatrical drapes is unnecessary and in many cases even undesirable. For the typical non-professional venue the innate opacity of BellaTEX’s theatrical velours are more than sufficient to stop light spills without showing on the face side. The additional weight of the lining requires larger capacity tracks and heavier duty support rigging. Unless the curtain is motorized or runs on a counterweight system, the extra weight can make smooth operation difficult. If you’re unsure about lining, talk it over with a BellaTEX representative. They can help you determine whether or not the added costs are going to pay off in added benefit. The Test Swatch is an extra piece of fabric stitched to the back side of the curtain. It is typically sewn in under the jute and the offstage side hem. 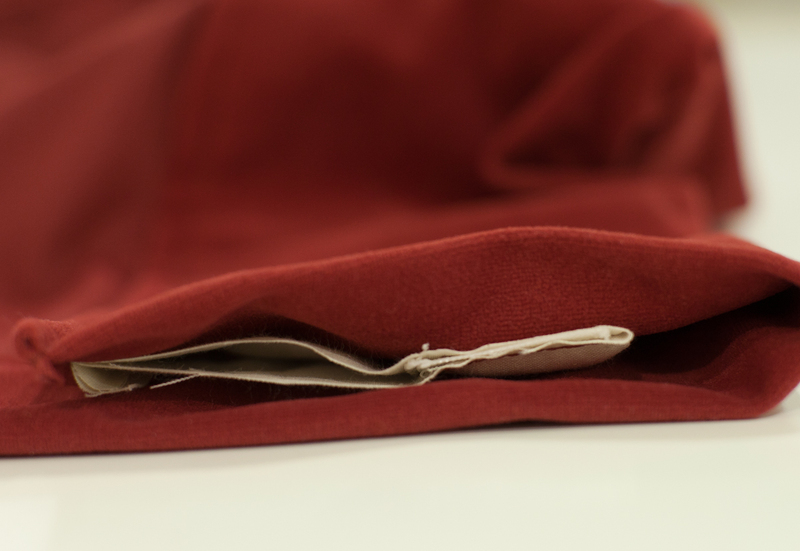 This fabric is from the exact same lot as the face fabric and because it is stitched in at manufacturing, will be the same age and have been exposed to the same environmental elements. Curtains need to be periodically re-checked to verify they meet NFPA flame resistant standards. This is a destructive test and requires a sample from the curtain. This test swatch provides a suitable place to take that sample without damage to the actual curtain. The Test Swatch also provides extra fabric that can be used to make minor repairs should the curtain get damaged by lights or scenery. This is of particular concern with cotton fabrics as differences in color between dye lots makes it virtually impossible to find an exact color match if none of the original fabric is available. Turnback is the amount of face fabric that is “turned back” on the leading and trailing edges of the curtain. The turnback is also referred to as the side hem. Depending on the situation and use the hem may only need to be a few inches, or, in the case of a fast moving draw, up to several feet. The purpose is to add a little weight to the edge so it hangs straight, and in the event it gets flipped around by movement, an actor, or a piece of moving scenery, the audience never sees an unfinished edge. Any amount of turnback is available, but typically valances, borders, scrims, & Cycs get 2” – 3”, while legs and tabs get 6”. Draw curtains get 12” or more on the leading edge and 2” – 3” on the offstage edge. However, a popular selection is to add the same amount of turnback on the onstage and offstage edge of a draw so the Stage Right and Stage Left panels can be swapped. This is helpful if the leading edge gets excessively worn or dirty as swapping the panels puts the worn side offstage where it can no longer be seen. This is a simple, low cost way to extend the useable life of your curtain. The dust ruffle is a sacrificial piece of black synthetic velour added to the bottom hem of draw curtains. It is stitched to the back side and hangs approximately 2” below the curtain. It is intended to drag the floor to prevent light leaks and, in the case of an elevated stage, prevent the audience from seeing under the curtain. The dust ruffle can be removed and replaced without damaging the curtain if it becomes worn. Paging Handles are fabric handholds stitched to the back side of the curtain at the side hem and first panel joint. 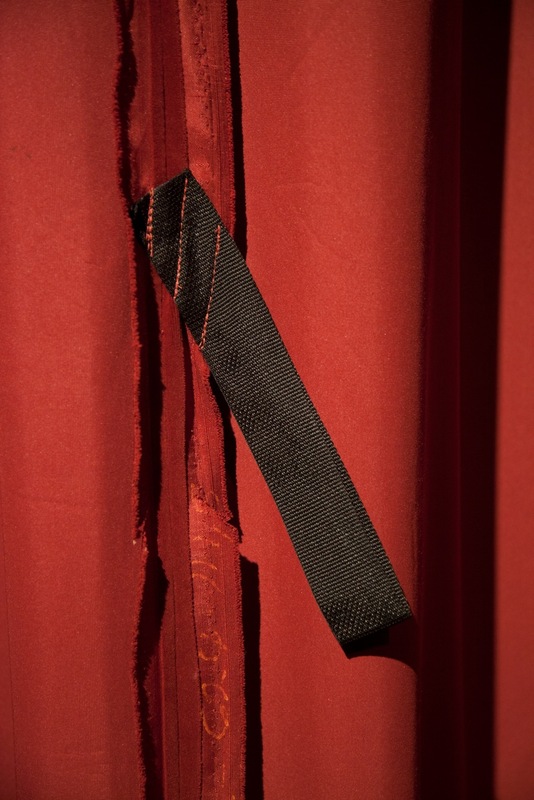 They are used by stagehands to grasp the curtain and pull (page) it open from the back side to allow an actor, MC, or other person to pass through without struggling through folds of fabric. Paging Handles are provided on both sides of the curtain unless otherwise specified. For bi-parting draw curtains, this means the curtain can be paged at either side of the proscenium opening and at the middle split. For schools, adding the school’s letters or mascot to the front of your Grand Valance can really enhance school spirit and provide a nostalgic image the students will always remember. BellaTEX offers chenille and embroidered letters appropriately sized to your valance in a variety of fonts and color schemes. Custom logos and mascots from your images are also available. Fringe can be added to the Grand Valance and/or Grand Drape as a way of adding an extra bit of flair. Most commonly, fringe is gold, in a twisted bullion style, but many colors and styles are available.